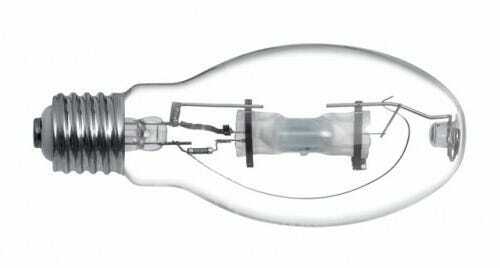 HID bulbs are categorized by the type of gas used in the bulb. The primary types used in horticulture include metal halide (MH), and high-pressure sodium (HPS). The main difference between the two bulbs is the type of light spectrum they produce (because of the gas inside). A metal halide lamp is an electrical lamp that produces light by an electric arc through a gaseous mixture of vaporized mercury and metal halides. Metal Halides also produce more pure white light than the HPS lamps, closer to daylight frequencies making it especially useful for growing plants. The MH bulb focuses on more of a blue spectrum and is used primarily for the vegetative stage of plant life.